The article below is from JulieFoucher.com. Julie is a phenomenal athlete that also happens to be in med school. Read what she has to say…the whole thing. You will better understand what SRC is all about. We’ve spent the last two weeks of medical school in our Endocrinology Block. Returning from a much-needed and very restful break for the holidays, I was excited to be learning about a new system and expected the coming days to be filled with discussion of those elusive glands and hormones I’d heard of, but never really knew exactly what purpose they served. While we did spend plenty of time learning about things like T3 and T4, Chromaffin cells, and the difference between the anterior and posterior pituitary, to my surprise (and perhaps also to my fascination) a significant portion of the past two weeks revolved around obesity. With all this buzz about obesity, I was fascinated by how quickly the word “exercise” passed in and out of conversation – as if it were some sort of fictional idea, a figment of the imagination that only worked in fairy tales and highly-controlled research studies. Instead, after rapidly dissuading the eager medical students’ suggestions of “lifestyle changes,” clinicians quickly turned the focus toward pharmacology and novel molecular targets for treating this epidemic. Did I miss something here? At first I was quite perplexed – if we know that exercise affords us countless health benefits and is likely to prevent diseases from diabetes to cancer, why are we searching so hard for the “magic bullet” drug to treat obesity and leaving this thoroughly tested and proven antidote to the wayside? What strikes me the most about many of our seminar discussions with highly-esteemed clinicians is their sheer lack of faith in the ability of any patient to adhere to an exercise regimen. But then I stop to think – can I blame them? Though I’ve only been immersed in the field of medicine for half a year now, I’ve become accustomed to the standard “diet and exercise” talk. Patients in need of serious lifestyle change are sent off for an appointment with the nutritionist and told to “exercise.” Now talk about an elusive idea – if I had been living an increasingly sedentary lifestyle for much of my adult life and was given these instructions, I would have no idea what to do either. Heck, I had no idea what to do or how to exercise the minute I was set free from my high school sports programs, and exercise had been part of my everyday life for years! The plethora of weight loss and fitness advice we are constantly bombarded with doesn’t help one bit – with so many options, many of them contradictory, and different people asking for your money, it’s nearly impossible not to become overwhelmed and discouraged before finding a program that works. So, why is it that doctors frequently leave it up to their patients to figure out? Sure, they might suggest Weight Watchers or purchasing a gym membership, but ultimately this choice is left up to the patient. 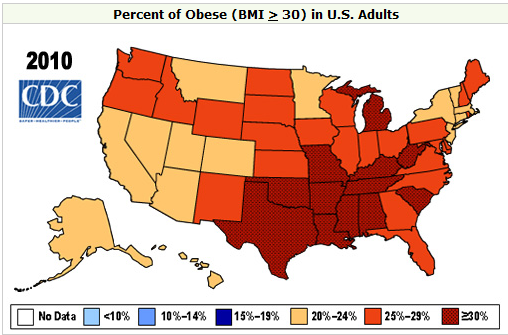 Do we leave other choices of this magnitude up to our patients? If I came in to see my physician with strep throat, would he make a few suggestions of what medication I should take and the dosage and leave it up to me to decide? Absolutely not! If I needed to rehabilitate a torn ACL would my doctor point me to a few online resources and send me on my way? Not at all! Next thing I know I would be standing in a physical therapy clinic receiving step-by-step instructions from a doctor who had helped countless others through ACL rehab, and I would be returning several times a week to ensure my therapy was completed fully and properly. So why is it that exercise, perhaps the most important and life-saving treatment of all, is so improperly “prescribed” by our physicians? The problems are many-fold, and as far as I can see they stem not from the doctors themselves but rather the health care system in which these doctors work. However, at least in my mind, the complexity of these problems doesn’t preclude working toward a solution. After these past two weeks, the disconnect between medicine and fitness has never been so apparent to me. While I always knew it existed, there is just quite nothing like experiencing first-hand the Grand-Canyon-sized gaping hole between experts in sickness and wellness, and experts in fitness. 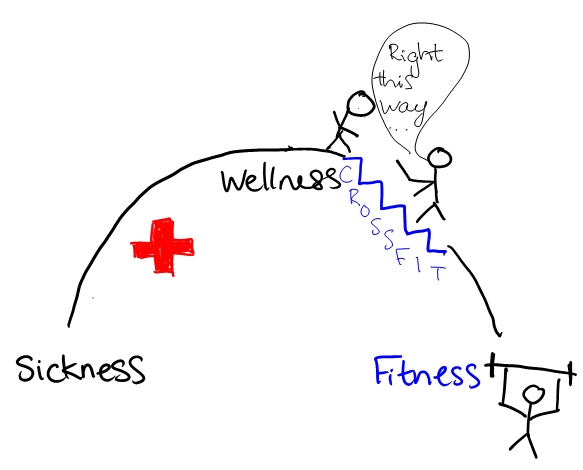 My favorite of CrossFit’s models of fitness is by far the “Sickness-Wellness-Fitness” continuum, yet in the context of medical care, this continuum is not quite as smooth as we might hope. Instead of individuals oscillating freely along from wellness to fitness, fitness to wellness, and occasionally (God forbid) inching over to sickness, we have a serious traffic jam on the Sickness-Wellness side of the spectrum. 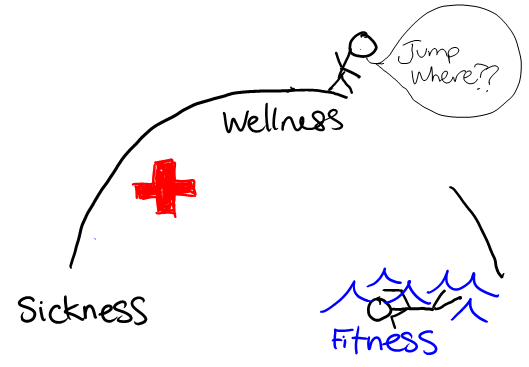 People are stockpiled on the cliff we call “Wellness,” peering over the edge and looking down at the polluted waters of “Fitness.” That’s a scary jump to take – and who knows where you will end up once you do? A $10-per-month gym membership? $100 for a video that promises to give you a six pack? What we need is something to bridge this gap – someone who can take patients by the hand and lead them toward the right side of this continuum, and it’s clear to me that CrossFit may just help us find that someone we need. “Your doctor is a lifeguard, not a swim coach” – Coach Greg Glassman.